In news first reported by TV Guide’s Michael Schneider Monday, the longest-running series in primetime TV history is expected to be sold by Twentieth Television to a cable network this year for airing in the fall of 2014. The Simpsons premiered in 1989 on Fox as a Christmas special and has been going strong ever since. The franchise amassed over $1 billion in revenue worldwide, becoming a huge cash cow for News Corp. 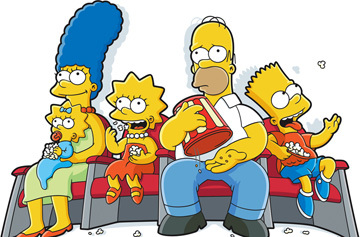 The Simpsons has aired in broadcast syndication since September 1994. The animated series was sold in broadcast syndication in the summer of 1993 with syndicated exclusivity, or “syndex” provisions, which were the norm at the time. This meant local stations who bought the show had exclusive rights in their market and prevented it from airing on a cable superstation or network. The Simpsons were sold without an episode cap, meaning stations had exclusivity rights as long Fox aired new episodes. But no one thought The Simpsons would still be churning out new episodes 25 seasons later – while the business of selling programs has changed significantly. For one, “syndex” isn’t really a sticking point anymore as most off-network deals today have cable components. In fact, cable networks now make offers before broadcasters do, as was the case with 30 Rock and The Big Bang Theory. Cable systems also no longer carry “imported” signals from other markets. Another notable oddity is when The Simpsons was sold into syndication, it was on a cash/barter basis with Twentieth retaining one minute of barter time to sell to national advertising for only five years. Since 1999, local stations have kept all commercial inventory in the show (which is the norm for most “evergreen”, or older TV shows), which keeps it off Nielsen’s weekly syndication chart, as TV By The Numbers notes. All recent off-net sitcoms are now sold with a barter component. With The Simpsons continuing to air on Fox, Twentieth is still bound by the contracts of the original deal with stations, which looks dated as rival adult animated series Family Guy, King Of The Hill, American Dad, Futurama, and South Park are not bound by such restrictions. In order for The Simpsons to be sold to cable, the series would have to end its run. With the transfer of Twentieth Television from New York-based Fox Television Stations heads Roger Ailes and Jack Abernethy to Gary Newman and Dana Walden of Los Angeles-based 20th Century Fox Television – and the recent split of News Corp. (with the non-publishing assets resting at 21st Century Fox), talk of maximizing The Simpsons‘ revenues gained more traction in recent months. The only hurdle at this point regarding a cable sale is amending those two decade-old contracts. The main three broadcast groups airing Simpsons in syndication are Fox (whose WFLD-TV in Chicago airs the series in prime access), Tribune Broadcasting, and Sinclair Broadcasting. With the series now north of 500 episodes – and a growing expense for many local stations, they could ask for a discount on future episodes they are contractually obligated to run in off-net in exchange as a form of balance sheet relief. Moreover, local stations have cut back on airing Simpsons reruns over the years as ratings declined (yes, the days of airing The Simpsons three times a day are long gone.) Even Fox O&Os – including WFLD – have cut back on Homer & Co. to make room for more news and first-run syndicated programming, such as TMZ, Dish Nation, Extra, and Access: Hollywood – and of course, off-net reruns of newer fare such as Big Bang and this fall, Modern Family. And despite what you’ve read elsewhere, The Simpsons – aren’t going anywhere, since the program still does well for Fox in key young demos. At Comic-Con, Groening announced the show would cross over with other property Futurama in a fall 2014 episode – not to mention a crossover appearance on Family Guy right around the same time. While not yet official – look for a renewal sometime in October- prospects for a 26th and 27th season for The Simpsons looks very good.